Discover why housestaff and faculty worldwide depend on this best-selling medical text - both in print and eBook format! Concise, user-friendly, and now available with a handy spiral binding, The Washington Manual® of Medical Therapeutics, 35th Edition, focuses on the essential information you need to know for successful patient care. Written by residents who are assisted by faculty co-authors and an outstanding editorial team, this must-have reference presents brief, logical approaches to diagnosis and management of commonly encountered medical conditions, including new therapies that improve patient outcomes. Thoroughly updated throughout, the 35th Edition provides a clear view of the challenges faced by residents, interns, medical students, and other practitioners, plus offers practical solutions, and expert guidance - all in one convenient and easily accessible source. Features: - New spiral binding allows The Manual to lie flat for easy, hands-free access. 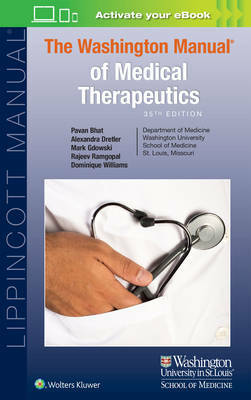 - Thoroughly updated to reflect the increasing and ever-changing advances in medical technology and therapeutics. - Comprehensive coverage addresses all areas of medicine and the core subspecialties, including neurology and toxicology content available online. - Concise, practical format features a brief discussion of pathophysiology, an evidence-based presentation of current therapies, and need-to-know diagnostic and therapeutic guidance from global experts. - Easy-to-follow guidelines, diagrams, and algorithms assist in the diagnosis, investigation, and management of frequently encountered medical conditions. - Edited by Internal Medicine Chief Residents from the Washington University School of Medicine and Barnes-Jewish Hospital in St. Louis. Now with the print edition, enjoy the bundled interactive eBook edition, which can be downloaded to your tablet and smartphone or accessed online and includes features like: - Complete content with enhanced navigation - Powerful search tools and smart navigation cross-links that pull results from content in the book, your notes, and even the web - Cross-linked pages, references, and more for easy navigation - Highlighting tool for easier reference of key content throughout the text - Ability to take and share notes with friends and colleagues - Quick reference tabbing to save your favorite content for future use The Washington Manual® is a registered mark belonging to Washington University in St. Louis to which international legal protection applies. The mark is used in this publication by LWW under license from Washington University.